Tulima Tautai has been told he will have to earn his chance in the Wigan side after serving a three-week ban. The 30-year-old is free for selection again but was left out of the 19-man squad for tomorrow's game at Castleford - despite the absence of Gabe Hamlin to a doping suspension and Tony Clubb to injury. Lam says young props Ollie Partington and Liam Byrne deserve their chance ahead of Tautai. “A couple of the young players stood up the last couple of weeks and those blokes need to be rewarded,” said Lam. Tautai, who signed a new three-year deal with Wigan in 2017, was handed a three-match suspension for kicking out at Huddersfield’s Ukuma Ta’ai in the 14-6 home defeat last month. 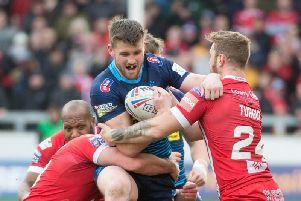 It was the this second disciplinary offence in the three games he has featured in this season, having receiving a sin-bin in the defeat to Hull FC, where he was a late addition to the side. Tom Davies and Morgan Escare were also fit members of the squad who have struggled to break into Lam's side last week and the coach could have two additional options for next week's trip to Wakefield, with Liam Marshall and Sam Powell set to return from short injury lay-offs.